Gov. 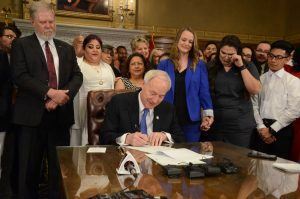 Asa Hutchinson said Wednesday (April 10) that he will sign a bill prohibiting “sanctuary cities” from receiving state funding despite his concerns that it could lead to racial profiling. Moments earlier, he had signed bills that will allow young illegal immigrants covered by the Deferred Action for Childhood Arrivals (DACA) program to receive in-state tuition and obtain nursing licenses. Hutchinson said in a meeting with reporters in his office that he will sign Senate Bill 411 by Sen. Gary Stubblefield, R-Branch. The bill would ban Arkansas municipalities that adopt sanctuary city policies from receiving state discretionary funds or grants. Cities could not limit municipal employees and officials from cooperating with federal immigration agencies such as Immigration and Customs Enforcement. They also could not grant to illegal immigrants the right to a lawful presence. The attorney general would decide if a municipality has violated the law. No Arkansas cities have enacted sanctuary policies. The bill passed the House on Wednesday, the day this year’s General Assembly recessed. Hutchinson said he was concerned about a section declaring that municipalities cannot enact a policy that “prevents law enforcement officers from asking a person about his or her citizenship or immigration status.” Without probable cause, it could lead to racial profiling, he said. “I have indicated that this is problematic that it is not included because it could lead to policing without any guidelines and police using their own judgments that could be based on what a person looks like versus good law enforcement policy,” he said. However, he said he was signing the bill after receiving assurances from Stubblefield that the senator will support adding a probable cause requirement in the next available session – either in two years during the next General Assembly, or in a special session if one occurs before that. Hutchinson released to reporters a letter he had written Wednesday to members of the General Assembly. He said in the letter that he had asked legislators to include a probable cause provision and said cities must provide officers “reasonable guidance” before they challenge residents about their immigration status. Rosa Ruvalcaba Serna wipes a tear from her eye as Gov. Hutchinson signs a bill into law sponsored by Rep. Dan Douglas, R-Bentonville, (red tie) and Rep. Megan Godfrey, D-Springdale, (blue jacket) look on. Mireya Reith, founding executive director of the immigrants rights group Arkansans United, said her group could seek legal action after cases of racial profiling occur, while municipalities already have a legal case to make. She said members of her community have been asking if it is safe to leave the house. She called on Hutchinson to express that Arkansas is a welcoming place and that changes in law enforcement practices won’t occur. A few minutes earlier, Reith had stood behind Hutchinson as he signed two bills that had her full support. House Bill 1684 by Rep. Dan Douglas, R-Bentonville, allows state higher education institutions to charge in-state tuition rates to DACA students who have lived in state for three years and have earned a high school diploma or an equivalency. The DACA policy protects from deportation qualifying immigrants brought to America illegally by their parents. It was created by an executive order by President Obama in 2012. President Trump’s administration tried to end the program but was blocked by a court order. HB 1684 also applies to students with work permits and those who have immigrated from the Marshall Islands. 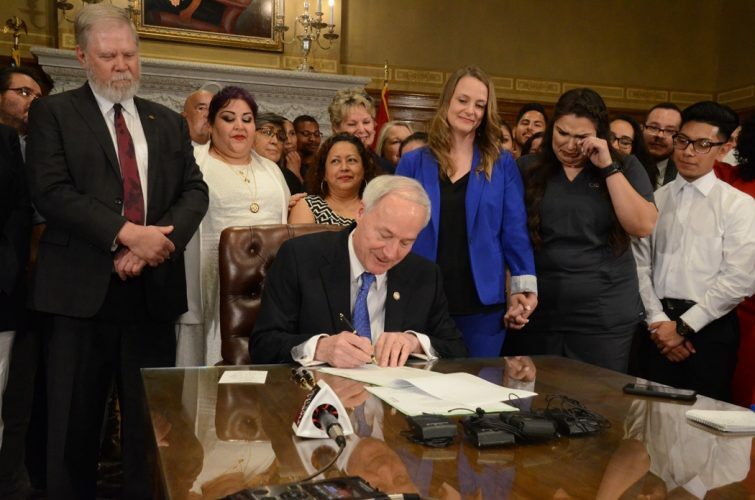 Hutchinson also signed into law HB 1552 by Rep. Megan Godfrey, D-Springdale, which allows the State Board of Nursing to grant licenses to students covered by DACA. The bill became necessary after the board stopped granting licenses in 2017 because it believed it needed clearer legal authority. Among those standing behind Hutchinson was Rosa Ruvalcaba Serna, a senior UAMS nursing student set to graduate in December and a participant in the DACA program. Serna was brought to America at age 6 and has lived in Arkansas since 2005. She wants to be an emergency nurse. Immigration activists rallied before the ceremony to celebrate the bill signings and to oppose the sanctuary cities bill. Godfrey skipped the rally in order to meet with Hutchinson and ask for a veto. “It was a day of highs and lows, and we felt really disappointed this morning and really elated this afternoon, and I think it would have been just a really great way to continue this celebration to get a veto from him,” Godfrey said.